Q.1 A traffic signal board, indicating 'SCHOOL AHEAD', is an equilateral triangle with side 'a'. Find the area of the signal board using Heron's formula. If its perimeter is 180 cm, what will be the area of the signal board? 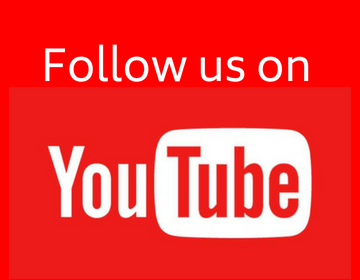 Q.2 The triangular side walls of a flyover have been used for advertisements. The sides of the walls are 122 m, 22 m and 120 m (see figure). The advertisements yield an earning of Rs 5000 per . A company hired one of its walls for 3 months. How much rent did it pay? First we find the semi perimeter of triangular side measuring 122 m, 22m and 120 m.
Q.3 There is a slide in a park. One of its side walls has been painted in blue colour with a message "KEEP THE PARK GREEN AND CLEAN" (See figure). If the sides of the wall are 15 m, 11 m and 6 m, find the area painted in colour. 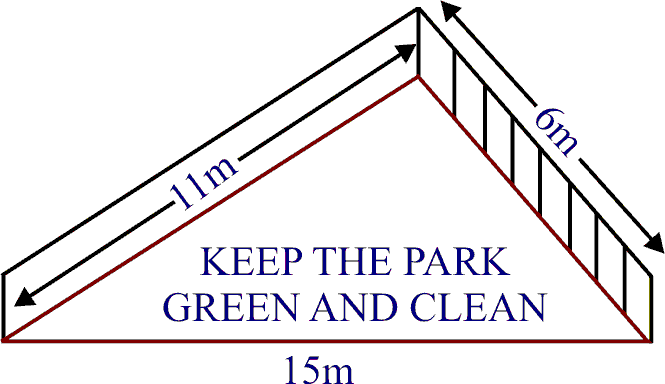 First find the semi perimeter of side wall measuring 15 m, 11 m and 6 m.
Q.4 Find the area of a triangle two sides of which are 18 cm and 10 cm and the perimeter is 42 cm. 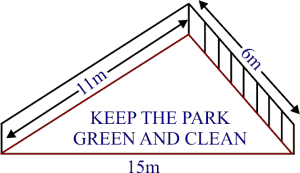 Q.5 Sides of a triangle are in the ratio of 12 : 17 : 25 and its perimeter is 540 cm. Find its area. Let the sides be a, b and c of the triangle. 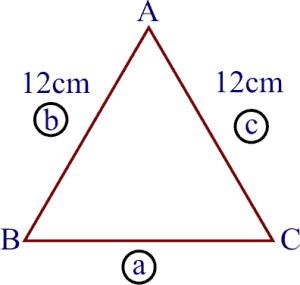 Q.6 An isosceles triangle has perimeter 30 cm and each of the equal sides is 12 cm. Find the area of the triangle. 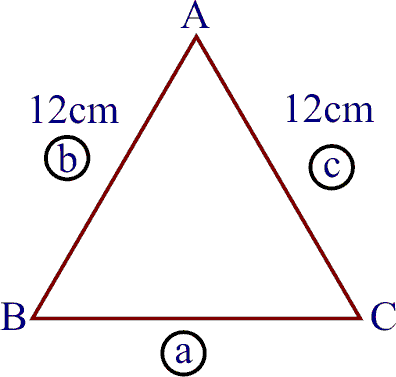 Hence, the area of triangle is = cm2.